"A sweet game where the objective is to give good hugs!" 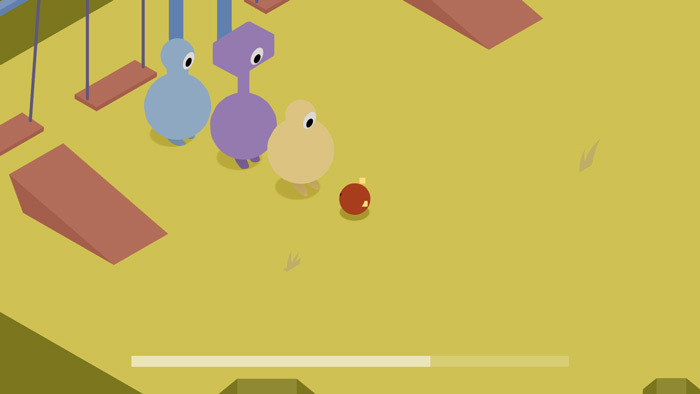 Hug Them Real Good is a silly yet very sweet game where you play as a sort of little red ball thing and must roll around the children’s playground finding other creatures to (not surprisingly) hug them, to do this correctly you need to scroll on your mouse to find the point where you can hug them not too hard and not too lightly if you hug too hard you will see them cry or too soft and they will show they are unhappy but get it just right and they will emit little hearts and maintain the hug for a few seconds and soon you will have a new friend. Once you have hugged these odd looking creatures they will start to follow you around the playground as you look for new creatures to hug and then join your merry band of strange looking creatures. While Hug Them Real Good doesn’t really offer any objectives in regards to game play it’s a funny and sweet place to spend a few minutes especially if you are feeling like you need a hug! You can download Hug Them Real Good here for free.